As you read this post further you will realize that, according to Islam, every created being – whether it is living or non-living objects – is in a state of submission to Allah and worships Him in a manner appropriate to its form and state. The sun, moon, stars, trees and animals are all in a state of subjugation to Allah and prostrate to Him, and all of them worship Him in an appropriate manner. Here's a similar verse from the Quran, but it goes on to say that we do not understand the glorification done by inanimate as well as animate beings. That's because we cannot comprehend yet how they glorify their Lord. There are many narrations from the Quran which is scientifically proven till date. Though science has proved plants and trees have life, however science has not yet advanced to prove inanimate objects too live. In another chapter in the Quran, Allah is talking about how He fashioned this universe in 6 days — He created the earth in 2 days (Quran 41:9) and that He placed mountains firmly on the earth over its surface and He blessed it and determined therein its sustenance in 4 equal days (Quran 41:10). 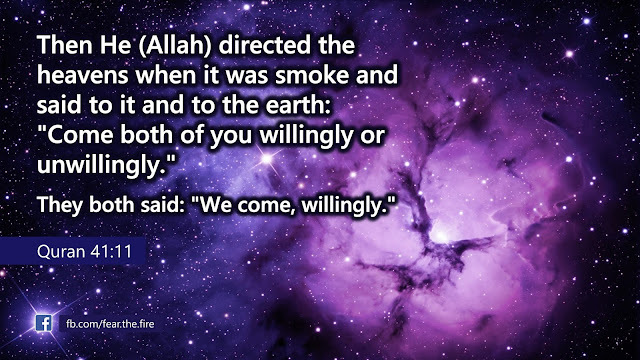 Allah goes on to says in the Quran 41:11, then He Istawa (rose over) towards the heaven when it was smoke, and said to it and to the earth (when they were not fully formed): "Come both of you willingly or unwillingly." They both said: "We come, willingly." 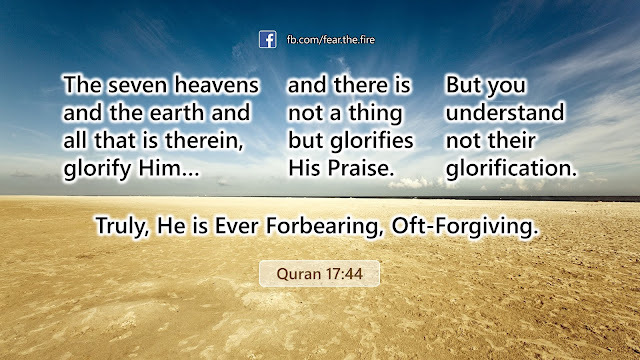 This is a very interesting verse that suggests the heaven and the earth, as a whole, are living objects and they glorify Allah in their own way. 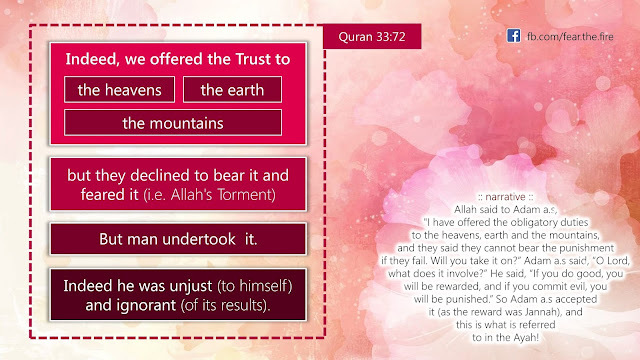 In another post we have mentioned, after Allah created the universe, He offered Al-Amanah (trust / obedience / obligatory duties of His religion) to the heavens, the earth, and the mountains on the grounds that if they fulfilled them, He would reward them; and if they failed, He would punish them. Due to the challenges and due to high risk involved the trio felt they won't be able to fulfill that responsibility. As a result the heavens, the earth and the mountains declined Allah's offer. Thus according to Islam the inanimate things like the heavens, the earth, and the mountains have life and live in a way that we do not understand. For better understanding of 33:72 read our post on 'Trials from Allah' where we have described this incident in more detail. Everyone Prostrates to Allah. The Shadow Metaphor. Quran 24:41 ~ See you not that Allah, He it is Whom glorify whosoever is in the heavens and the earth, and the birds with wings out-spread (in their flight). Of each one He (Allah) knows indeed his Salat (prayer) and his glorification, [or everyone knows his Salat (prayer) and his glorification], and Allah is All-Aware of what they do. Quran 16:48-49 ~ Have they not observed things that Allah has created: (how) their shadows incline to the right and to the left, making prostration unto Allah, and they are lowly? And to Allah prostrate all that is in the heavens and all that is in the earth, of the moving (living) creatures and the angels, and they are not proud (i.e. they worship their Lord (Allah) with humility). Imam Ibn Kathir has said that Allah is telling us of His Might, Majesty and Pride, for everything submits to Him and all things and creatures humble themselves before Him, inanimate objects and animals, and those which are accountable among mankind and the jinn, and the angels. Allah tells us that everything that has a shadow that inclines towards the right and towards the left – i.e., morning and evening – prostrates to Allah. Allah has confirmed that all beings prostrate to Him, and He has explained how some of them prostrate, which is by the inclining of its shadow towards the right and the left. It does not mean that everything prostrates on seven parts of the body; that applies only to the humans. The prostration of all other beings is in accordance with their nature. 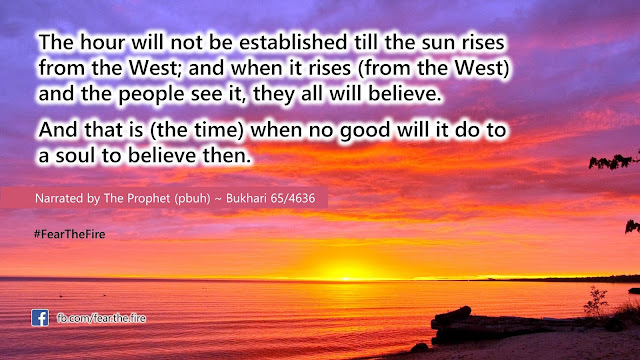 "The hour will not be established till the sun rises from the West; and when it rises (from the West) and the people see it, they all will believe. 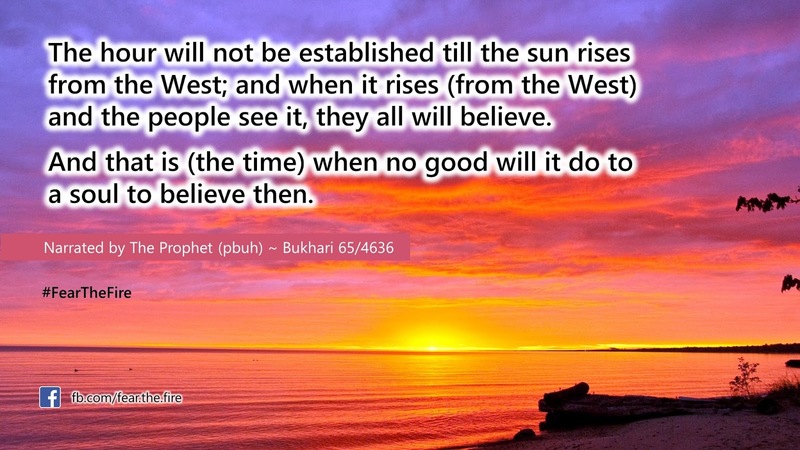 And that is (the time) when no good will it do to a soul to believe then." ~ Bukhari 65/4636. 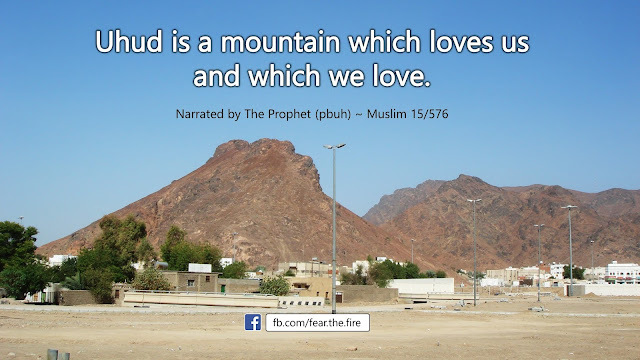 Mount Uhud is the largest mountain in Madinah. It is located in the north of Madinah and it consists of a group of mountains that extends from the east to the west with a length of seven kilometers. Its width is almost three kilometers, and it is at a distance of five kilometers from the mosque of the Prophet (pbuh). The Prophet (pbuh) once climbed the mountain of Uhud with his companions Abu Bakr (ra), Umar (ra) and Uthman (ra). The mountain shook with them. The Prophet (pbuh) said to the mountain, "Be firm, O Uhud! For on you there are no more than a Prophet, a Siddiq (truthful; Abu Bakr) and two martyrs (Umar & Uthman)." ~ Bukhari 62/25 ... The Prophet (pbuh) thus prophecised that Umar and Uthman, the two companions, will be martyred one day, which did happen few years after The Prophet's demise. A bit of a background on this story is: Prophet Moses was a shy person and used to cover his body completely because of his extensive shyness. One of the children of Israel hurt him by saying, 'He covers his body in this way only because of some defect in his skin, either leprosy or scrotal hernia, or he has some other defect'. Allah wished to clear Prophet Moses of what they said about him, so one day while Moses was in seclusion, he took off his clothes and put them on a stone and started taking a bath ... the rest of the narration is above. The people saw Prophet Moses naked and as a result found him the best of what Allah had created. Thus Allah cleared him of what his clan used to accused him of. 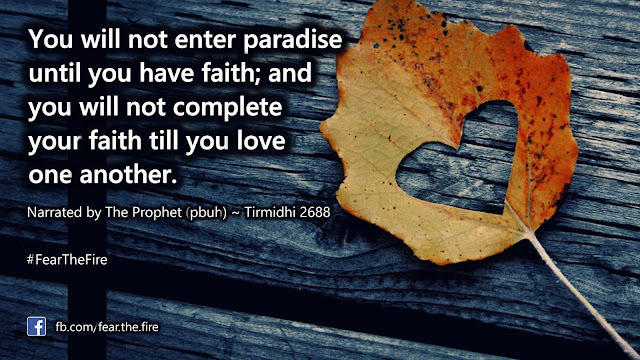 Whenever Al-Hasan Al-Basri (ra) discussed this hadith, he said, Fellow Muslims! A piece of wood longed for the Messenger of Allah (pbuh)! You are more obligated than this piece of wood to long for him.” A sign of true love for the Prophet (pbuh) is to follow his guidance without excess or negligence. On the day of resurrection, when the enemies of Allah will be gathered infront of Hell Fire in rows, their eyes and skins will testify against them of what they used to do (on earth). Quran 41:20-21 ~ "... their eyes and their skins will testify against them of what they used to do. And they will say to their skins, "Why have you testified against us?" They will say, "We were made to speak by Allah , who has made everything speak; and He created you the first time, and to Him you are returned." All these narrations including the Quranic verses suggests that inanimate objects do have some sort of life. It is because of deficiency in ourselves that we cannot detect the life in them yet. Or should we say that science has not yet advanced or is matured to a level where it can't figure out if this is true. Or in other words hasn't science recently proved that plants breath and make their food, communicate with each other, can feel pain, love good music, and cry for help? Just like we recently discovered ant's talk to each other, Quran narrated this 1400 years ago. So guess in a little while we will believe inanimate stuff are also animate in some form. Why does Allah tests mankind?